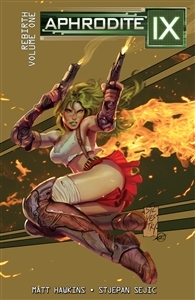 TOP COW’S FAVORITE EMERALD-HAIRED ASSASSIN RETURNS! Hundreds of years after a cataclysmic event scorched the surface, Earth and its inhabitants have been forever altered and a new landscape and political struggle has taken hold between two distinct factions fighting for control. Aphrodite IX is both anachronism and advanced technology in a world that she no longer recognizes. To survive in this future, she must choose sides in a war that she wants no part in.